EGL certified 1.03CT superb center diamond of G Color, VS1 Clarity, with matched 0.31CT side diamonds. 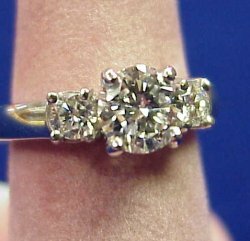 We have these lovely diamonds mounted in classic platinum for the timeless look that will never go out of style. 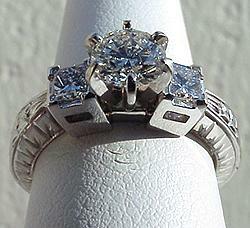 Three stone diamond rings are hot! 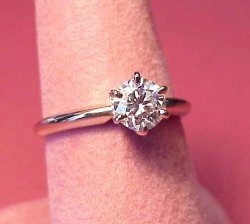 The center stone weighs 0.52CT of G Color, VS2 Clarity. 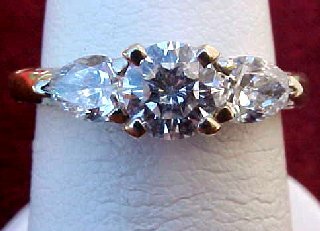 Each side diamond weighs 0.17CT, each with matching G Color, SI Clarity, (0.86CT TW). 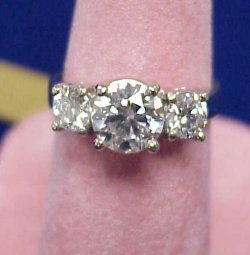 1.85CT TW timeless three stone diamond ring. 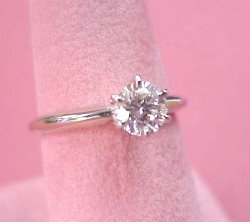 The center diamond is 1.22CT GIA certified, with 0.63CT TW side diamonds. 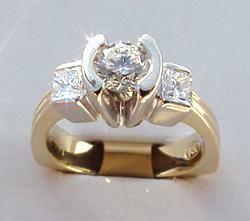 A well balanced ring in a beautiful 14KW gold setting. Here is an absolute stunning 0.68CT center diamond of G Color, SI1 Clarity, accompanied by two matching quality 0.19CT princess cut diamonds, mounted in our own beautiful 14KW gold mounting! EGL certified 0.54CT center diamond of D Color, SI2 Clarity, with two 0.31CT pear cut diamonds each of F Color, SI2 Clarity, for a total diamond ring weight of 1.16CT! The mounting is an engraved in 14KW gold! Check out our pictures! 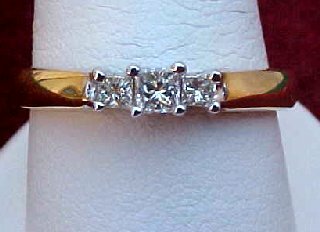 Popular 0.25CT princess cut diamonds set in a 14K two-tone gold band! Always a popular piece of fine jewelry. 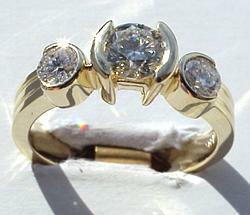 Set with 3 round brilliant cut diamonds of I Color, I1 Clarity and fashioned in 14K gold. 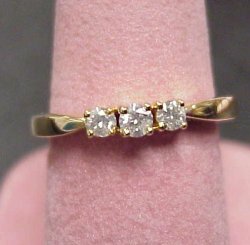 Dont forget to select your diamond after you have found the perfect mounting. 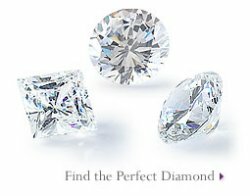 Check out our selection of loose diamonds at...DiamondsHere.com Certified Loose Diamonds Dept. Wow! 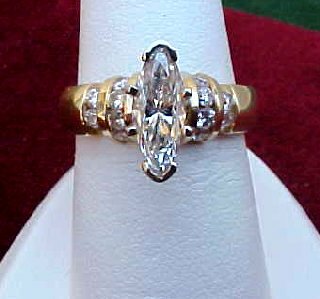 She will love this 1.26CT marquise cut diamond with 12 round brilliant cut diamonds set in 14K gold!